Buttercup Down (Chatsworth) at Haddon Grove Farm Cottages near Bakewellin Over Haddon, near Bakewell sleeps 4 people. Haddon Grove Farm Cottages near Bakewell is set in the spectacular Peak District National Park; a collection of renovated holiday cottages each boasting their own unique character. This beautifully decorated semi-detached cottage has one double bedroom and a twin room. It is ideal for 8 people or two families, as it has the option of an interconnecting door with Dandelion (ref UK4048 [Haddon Grove Farm Cottages]), with the benefit of seating available in this cottage for the whole party, yet allowing you to have your own privacy. There is also a fabulous, shared indoor swimming pool, along with a games room and outside play area. Situated just outside Bakewell, this attractive, famous little market town retains a delightful rural atmosphere and offers a good selection of shops, restaurants and pubs, as well as local farmers’ markets. There is an old 17th-century market hall in the town centre where you can explore the weekly farmers’ market. Bakewell is situated within the Peak District National Park and is ideally placed for exploring this beautiful region. Both the rugged Dark Peak and the softer limestone White Peak are within easy reach, and Alton Towers, Britain’s premier theme park, is only a short drive away. Derbyshire’s bustling market towns, villages, hills, dales and rivers offer majestic scenery, and a rich variety of customs. Boasting a varied and beautiful landscape, they offer a blend of heritage, history and family attractions.There are many stately homes to visit including Chatsworth House, Haddon Hall and Hardwick Hall to mention just a few, while the impressive caverns in nearby Castleton and Little John’s burial place in Hathersage are also well worth a visit. The shop and restaurant are 3 miles, with the pub 2 miles from Haddon Grove Farm Cottages near Bakewell. (All cottages at Haddon Grove Farm Cottages near Bakewell refs UK4049 [Haddon Grove Farm Cottages], UK4048 [Haddon Grove Farm Cottages], UK4050, UK4051 [Haddon Grove Farm Cottages], UK4052 [Haddon Grove Farm Cottages], UK4053 [Haddon Grove Farm Cottages], UK4054 [Haddon Grove Farm Cottages], UK4055 [Haddon Grove Farm Cottages], UK4056 [Haddon Grove Farm Cottages], UK4057 [Haddon Grove Farm Cottages]). First Floor: Bedroom 2: With twin beds. Electric central heating, electricity, bed linen and Wi-Fi included. Towel hire. Travel cot, highchair and stairgate available on request. Welcome pack. Laundry room (shared with other properties). Patio with sitting-out area and garden furniture. Garden (shared with other properties on site). Indoor heated swimming pool (shared with other properties on site, open 8am-10pm) with shower and changing facilities. Games room (shared with other properties on site). Children’s play area (shared with other properties on site). Private parking for 2 cars. No smoking. Please note: Buttercup Down (Chatsworth) has an interconnecting door and can be booked together with Dandelion (Ash) (UK4048) to accommodate up to 8 guests. Pets allowed at Buttercup Down (Chatsworth). For a better idea of where Buttercup Down (Chatsworth) - Haddon Grove Farm Cottages is, you can see Buttercup Down (Chatsworth) - Haddon Grove Farm Cottages on the map below. 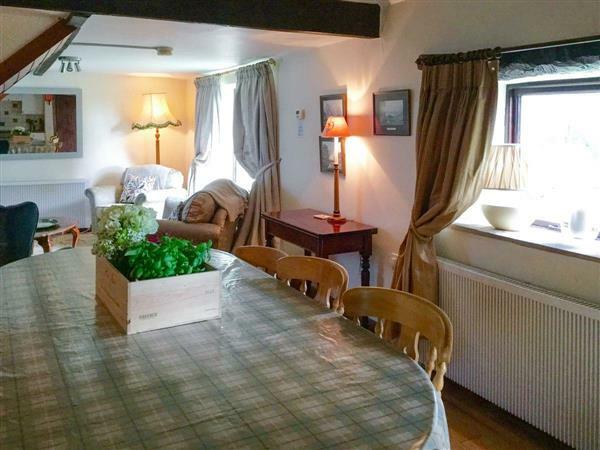 Buttercup Down (Chatsworth) - Haddon Grove Farm Cottages is in Derbyshire; should you be on the lookout for a special offer, you can find all the special offers in Derbyshire. It's always worth checking to see what is on offer at the moment. Do you want to holiday near Buttercup Down (Chatsworth) - Haddon Grove Farm Cottages (UK4050), you can see other cottages within 25 miles of Buttercup Down (Chatsworth) - Haddon Grove Farm Cottages; have a look to find your perfect holiday location.